The table below lists the virological measures and assessments of objective cold signs and subjective cold symptoms that were collected in PCS3. Data derived from these measures were used to determine infection with the challenge virus and subsequent development of clinical upper respiratory illness. The criteria used for identifying infection and illness are described in detail below. PCS3 used two sets of criteria to determine the presence of upper respiratory tract involvement, with the first being based on participants’ self-reports of perceived physical symptoms and the second on objectively assessed signs of upper respiratory pathology. Henceforth, we will refer to these as the subjective definition (or subjective criteria) and the objective definition (or objective criteria), respectively. The subjective criteria have been used widely in the virology literature. We prefer the objective criteria because they focus on observable disease pathology and thus completely eliminate any possibility that the outcome reflects biases in how individuals perceive or report their bodily sensations. Again, we emphasize that satisfaction of the sign and symptom criteria discussed below is suggestive of clinical illness only in the context of a verified infection. Average (across all post-challenge days) baseline-adjusted nasal mucociliary clearance time of 7 minutes or longer (or total clearance time across 5 post-challenge days of 35 minutes or longer, as reported in some publications). Figure 1 provides a visual representation of the decision paths used to determine whether participants developed a clinical illness using the objective criteria. We have favored the objective criteria for upper respiratory involvement described above because subjective assessments of symptoms and illness may be influenced by psychological variables. Such effects may occur independent of any influence of the objective signs of disease. However, historically, virologists studying risk factors for colds have used subjective criteria. Here we describe the modified Jackson Criteria (Gwaltney, Moskalski, & Hendley, 1980), which take into account individuals’ subjective ratings of 8 respiratory symptoms identified by Jackson and colleagues (1958) as being characteristic of the common cold. Importantly, satisfaction of subjective upper respiratory symptom criteria is suggestive of clinical illness only in the context of a verified infection. In addition to rating the severity of these 8 symptoms, participants were asked each day whether they thought that had a cold or flu. Symptom severity ratings were summed within each day to create a daily Jackson Symptom Score (possible range, 0 to 32). 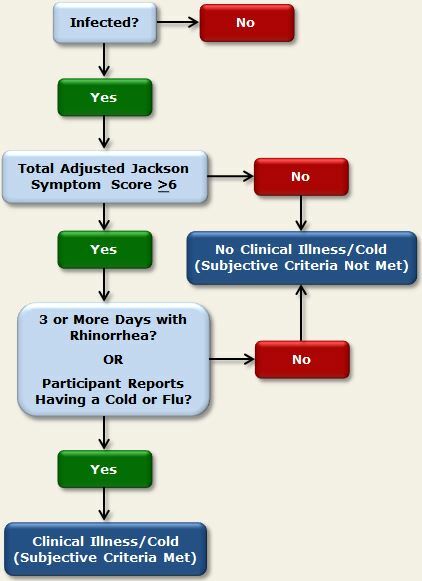 Adjusted Daily Jackson Symptom Scores were computed by subtracting the DAY 0 (pre-challenge) Jackson Symptom Score from the Jackson Score reported on each subsequent post-challenge day. Adjusted scores were then averaged across all post-challenge days to create a Total Adjusted Jackson Symptom Score. Participants who both became infected with the challenge virus and whose symptom reports met the above-described criteria, were determined to have developed a cold by the subjective definition. 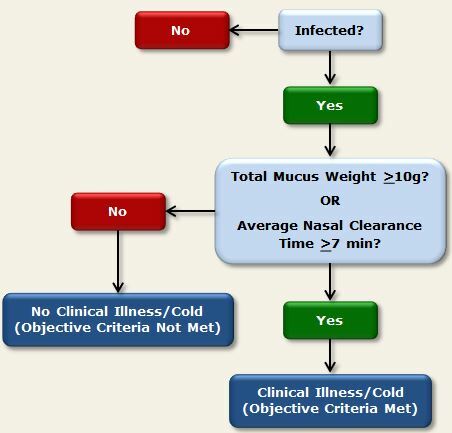 Figure 2 below provides a visual representation of the decision paths used to determine the presence of clinical illness using the subjective criteria. 1 In addition to the baseline and post-challenge samples, PCS3 included a screening sample that was collected 2 months prior to viral challenge. Based on this sample, volunteers were excluded from participation if their serum specific Ab titers were >4. 2 Symptom ratings used in the creation of the original Jackson criteria (Jackson et al., 1958) were rated on a scale of 0 to 3, and the criterion score was a total of 14 points over a post-challenge observation period of 6 days. As with the modified criteria, individuals also had to report having a cold or experiencing 3 or more days with rhinorrhea. Cohen, S., Doyle, W. J., Skoner, D. P., Rabin, B. S., & Gwaltney, J. M., Jr. (1997). Social ties and susceptibility to the common cold. Journal of the American Medical Association, 277, 1940-1944. Gwaltney, J. M. Jr., Colonno, R. J., Hamparian, V. V., & Turner, R. B. (1989). Rhinovirus. In N. J. Schmidt & R. W. Emmons (Eds). Diagnostic procedures for viral, rickettsial, and chlamydial infections, 6th ed (pp. 579-614). Washington, D.C.: American Public Health Association. Gwaltney, J. M. Jr., Moskalski, P. B., & Hendley, J. O. (1980). Interruption of experimental rhinovirus transmission. Journal of Infectious Diseases, 142, 811-815. Jackson, G. G., Dowling, H. F., Spiesman, I. G., & Boand, A. V. (1958). Transmission of the common cold to volunteers under controlled conditions. I. The common cold as a clinical entity. Archives of Internal Medicine, 101, 267-278.